useful to you and your family. 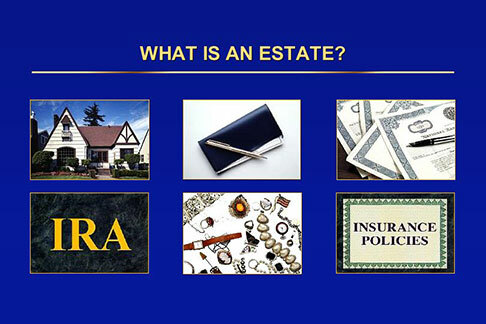 First, what is an estate? insurance policies, collectibles, and personal belongings. 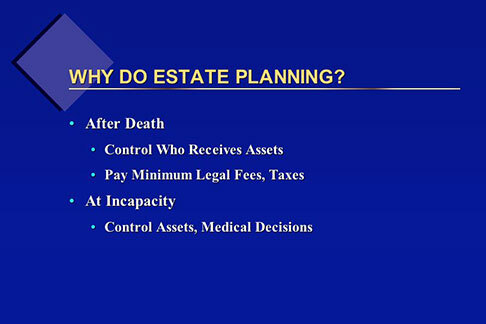 Now, why do people do estate planning? you die. 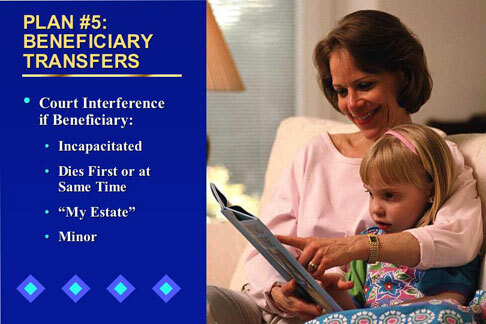 A good estate plan will also protect you at incapacity. can no longer handle your own affairs. 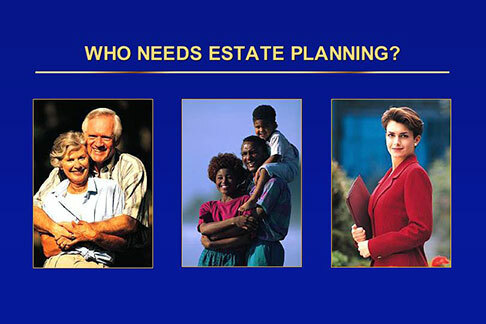 So, who needs to do estate planning? But families with young children need to do estate planning. So do people who have children from previous marriages. Single adults -- young or old -- need to plan as well. might recognize and see how they planned their estates. less than $1 million went to his heirs. 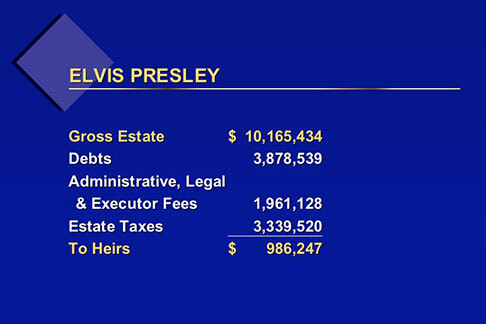 executor fees, probate and other "administrative" costs. 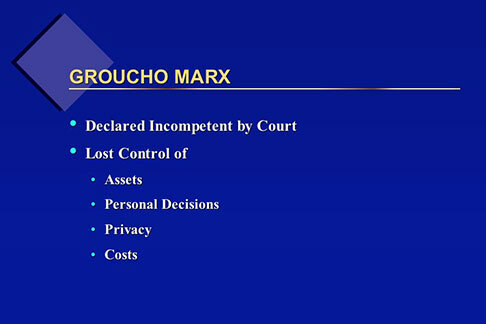 Groucho Marx had a will, too. But he didn't plan for incapacity. battled for control over his care-and his money. estates. After this presentation, you'll know how to do that. 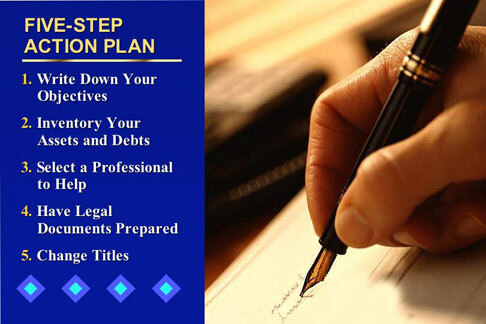 So, how do you plan your estate? 6. 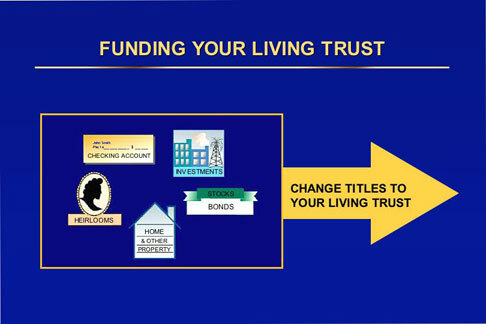 Having a living trust. you want to receive your assets after you die. assets are distributed according to your will. the person listed as the owner cannot sign his or her name. name. And your family and friends can't just sign FOR you. Only the court can change titles after someone dies. name must go through probate so the titles can be changed. survey of probate fees a few years ago. the laws -- and costs -- in that state. it takes over a year. 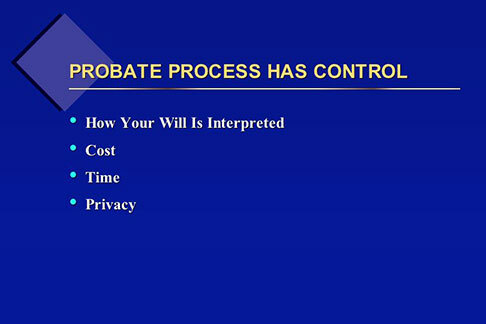 Probate is also a public process. Any "interested party"
"invites" disgruntled heirs to contest your will. 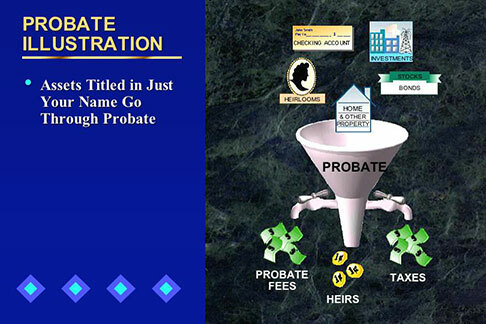 use probate files as a source for new business. 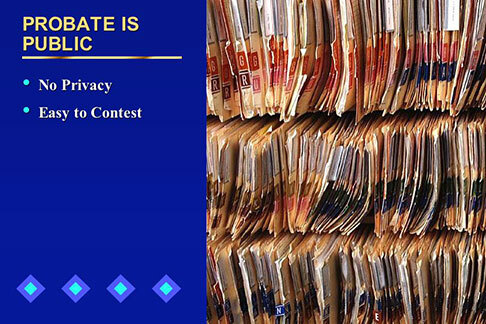 will cost, how long it will take and what information is made public. There's another problem with a will. 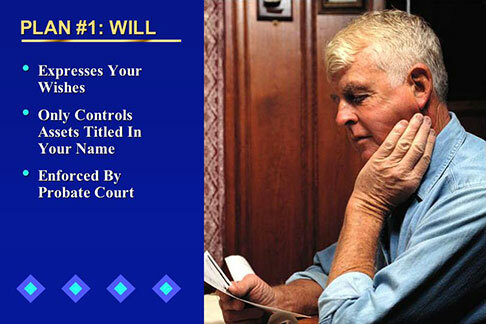 a court appointee can sign for you -- even if you have a will. 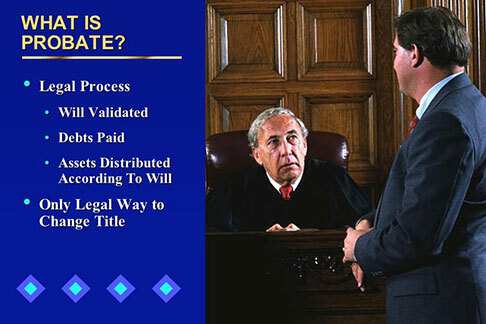 Having the court involved can be expensive and time consuming. It's a public process. And it doesn't replace probate when you die. result from handing over your assets to someone else. 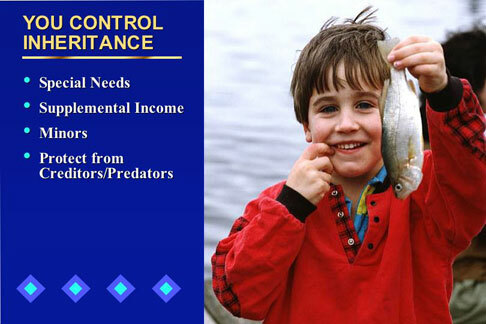 will control the child's inheritance until the child reaches legal age. 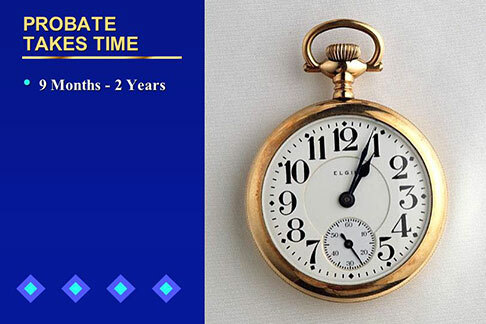 At that time, the child will receive the full inheritance. This is not what most parents and grandparents would want. simple will, you have no choice. 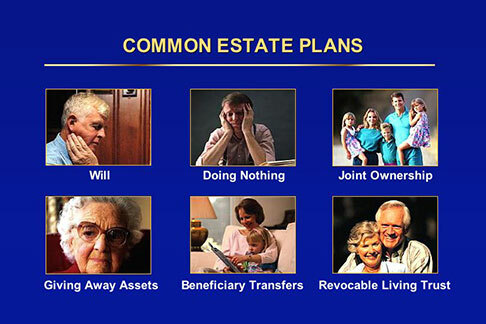 Common estate plan #2 is "doing nothing." 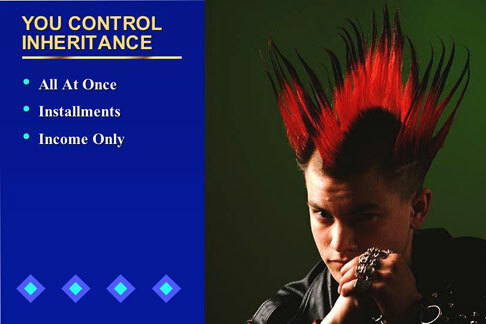 will probably take control of your assets. 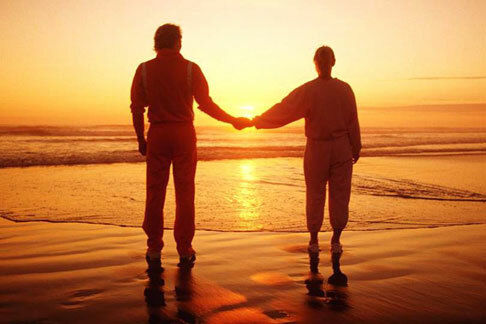 your spouse probably own most of your assets jointly. control they want. Let's see. Meet Tom and Ann and their kids. joint tenants with right of survivorship. 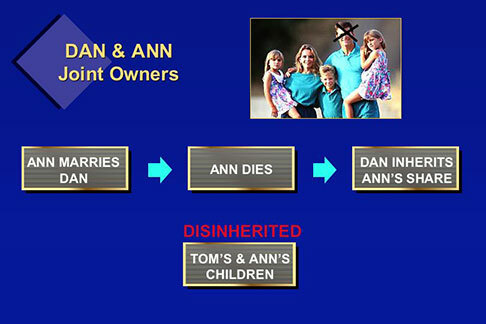 Ann automatically becomes the sole owner of their home. But what happens when Ann dies? 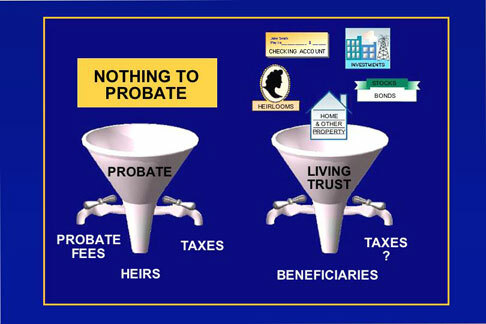 Is there a probate? Yes. 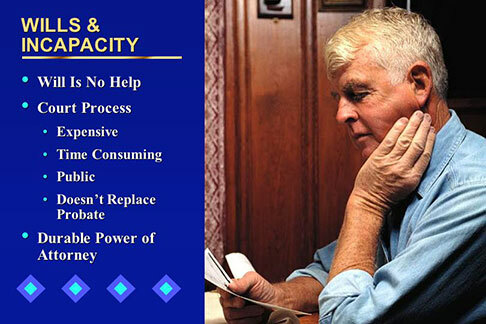 Owning assets jointly can cause other problems, too. belongs to Dan and he can do anything he wants with it. automatically to a surviving joint owner. 1. 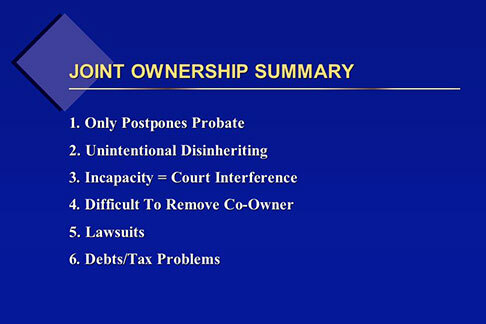 It doesn't avoid probate -- it just postpones it. with a new co-owner -- the court! is not. If your co-owner doesn't agree, you could end up in court. an accident that involves the jointly-owned asset. could be seized as settlement. 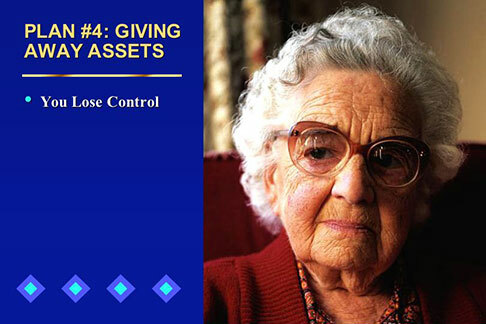 Giving away assets is another estate "plan" people use. make things easier if they become incapacitated and after they die. But what happens if you want -- or need -- the asset later? Will your children give it back to you? Maybe, maybe not. not even to your children! be giving the recipient an income tax problem. Tom, who then sells it for $350,000. 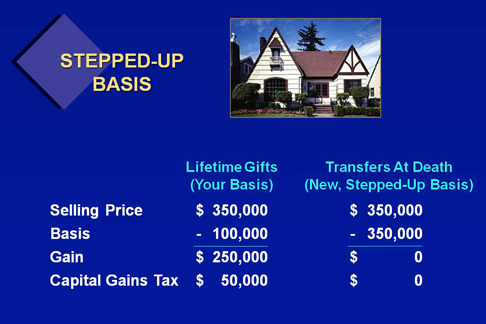 current tax law, he will have to pay $50,000 in capital gains tax. 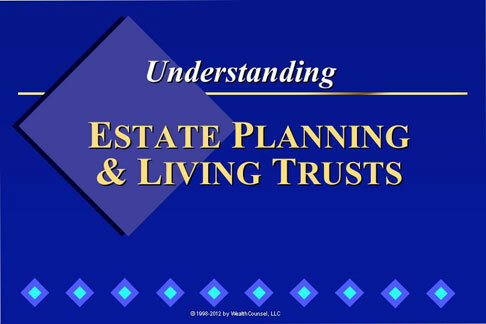 inheritance through a will or trust. of the date of Bob’s death—$350,000. and no capital gains tax to pay. 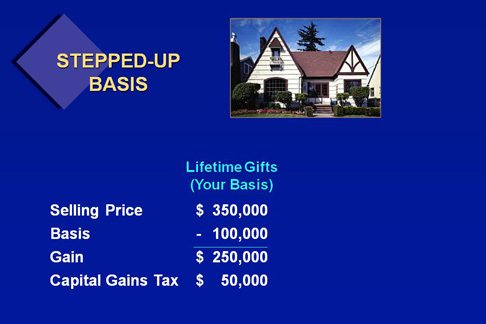 Tom $50,000 in capital gains tax. 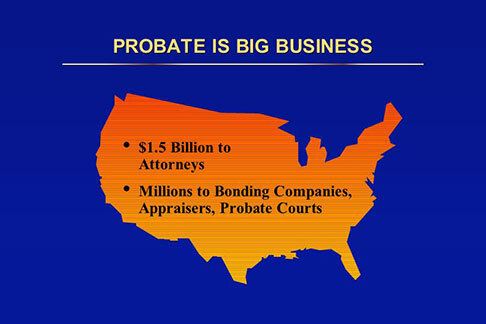 without probate -- but not always. probate court will have to determine who "my estate" is. 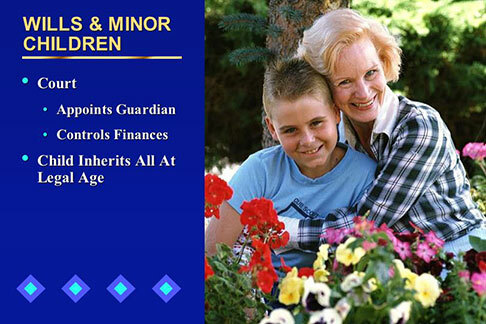 companies will not knowingly pay large sums of money to a minor. 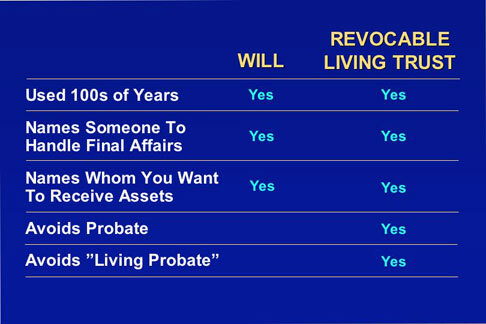 Our last "plan" is a revocable living trust. and wealth -- instead of a will and the other plans you've just seen. and how it lets you keep more control than other plans. documents that have been around for hundreds of years. In both, you name someone to handle your affairs after you die. In a will, this person is called an executor or an administrator. 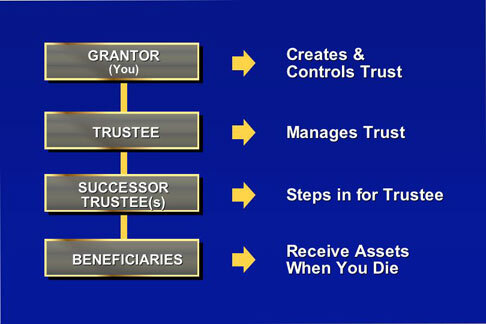 In a living trust, this person is called a trustee. of the Smith Family Trust dated (insert the date you sign your trust)." This is called "funding" your living trust. could do before you put them in your trust. that's why it's called a REVOCABLE living trust. except the names on the titles. trust than you do now. creates and controls the trust. 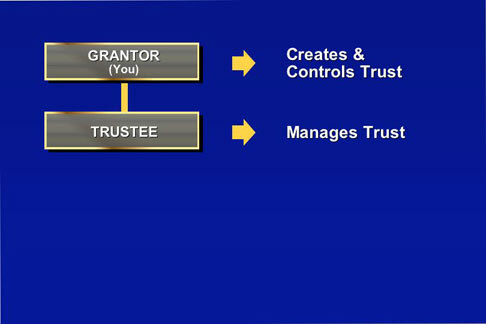 You are the grantor of your trust. And only you, as the grantor, can make changes to your trust. That's how you keep control. co-trustee. More about them in a minute. trusted friend or corporate trustee as their successor trustee. will receive your assets after you die. 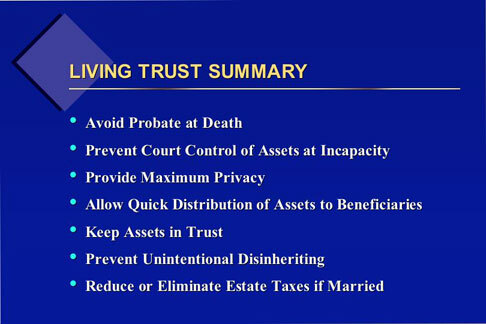 have the time, ability or desire to manage their own trusts. usually has less experience, time and resources. when they begin to act as trustee. you want them to inherit. so they have more than one opportunity to use the money wisely. but very important -- community service work. invested well, could even help provide for future generations. gives you this much flexibility and control. 7. Reduce or eliminate estate taxes if you are married. pertain to medical decisions, and see how much control they each give you. the use of life support -- if you become unable to make them yourself. close friends, business partners, advisors and others. 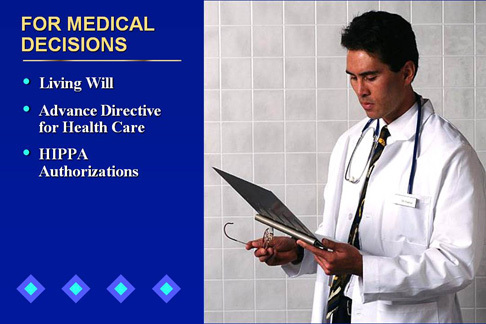 financially and medically -- here's what you need to do. 2. Inventory your assets and debts. Find out how much you own. questions and who will be there when you need him or her. 4. Have the legal documents prepared. 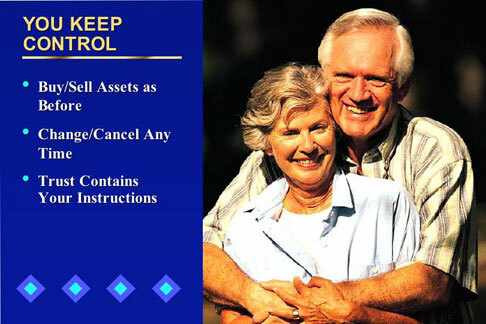 can only control the assets you put into it. and friends, knowing your good planning will have a happy ending. And that will give you the biggest benefit of all...peace of mind. planning to save you and your family time, anxiety and money.